Fits many older Turntables such as Akai, Marantz, Technics and Others. Other colors and types are available! The Philmore-Ditek SPG Digital Stylus Tracking Force Gauge is the precision of digital technology with a very affordable price. This easy-to-use measuring device was developed to give listeners a way to insure against the problems caused by improper tracking force settings, which include mis-tracking, excessive record and tip wear, and poor sound reproduction. This gauge is a highly accurate digital balance instrument designed to measure the actual downward force exerted by a stylus on a record over the range of 0.01 to 5.0 grams. Each gauge is calibrated with an included 5.0 gram weight, and displays readings in 0.01 gram increments in order to provide a very precise measurement of stylus tracking force. The Shure SFG-2 Stylus Tracking Force Gauge is the industry standard. This simple-to-use measuring device was developed to give listeners a way to insure against the problems caused by improper tracking force settings, which include mis-tracking, excessive record and tip wear, and poor sound reproduction. This gauge is a highly accurate beam balance instrument designed to measure the actual downward force exerted by a stylus on a record over the range of 0.5 to 3.0 grams. Each gauge is individually calibrated, and displays readings in 0.05 gram increments in order to provide a precise measurement of stylus tracking force. The Safest Way to Remove Waxy Deposits, Dust or other Deposit Build-Up from Your Phono Stylus. D5SC060 Stylus Cleaning Formula Dissolves Foreign Material Known to Hinder Proper Stylus Tracking. Brush Applicator Quickly Whisks Away and Dissolves Deposits Without Harming the Delicate Diamond Stylus. A Regular Regimen Between Album Side Plays Extends Both Stylus and Record Life. This Fluid is Particularly Important for Cartridges and Tone Arms which use Low Tracking Force. D5SC060 Stylus Cleaning Formula Includes Applicator in Cap. The D5SC060 Stylus Cleaning Formula in a 2.02 Ounce (60 ml.) Smoked Glass Bottle. Avoid Prolonged Breathing of Vapors or Immediate Contact with Skin. In case of eye contact, flush with water immediately. If swallowed, induce vomiting only when conscious. Call a physician. This FLAMMABLE formula should NOT be used near heat, sparks or open flame. 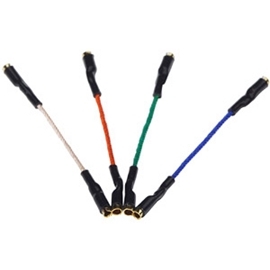 Four "color coded" headshell wires. Gold plated terminals for best conduction. Not Shown to Actual Size. Greater clarity and contrast from damping vinyl records on glass or metal platters. Contains more than 1,000,000 conductive carbon fibers for effective record cleaning. Works well on LCD screens and keyboards too! Double barrel for wider dispersion. No battery or electrical connections necessary. Keeps your records cleaner and quieter. Use wherever static build-up is a problem.